Earlier this summer I found myself practically buried in fresh blueberries. I was rifling through all of my cookbooks looking for something new and different to make using some of the berries. I landed on this recipe for angel food cake muffins with blueberries. These were delicate & sweet with happy little bursts of berries. Without a doubt I will be making these muffin/cupcakes again. Position a rack in the center of the oven. Lightly grease a standard-size muffin tin with non-stick cooking spray or use ungreased paper muffin cups. Sift the cake flour, confectioner’s sugar, and salt onto a piece of parchment or waxed paper and set aside. In a small bowl, toss the blueberries with the vanilla. In a clean bowl of an electric mixer fitted with the whisk attachment, beat the egg whites and cream of tartar on medium-low speed until frothy. Add 1 tablespoon of the granulated sugar and beat at medium until soft peaks form. Beat in the remaining granulated sugar, a raise the speed to high. Beat until stiff peaks form. While the eggs are beating, preheat the oven to 375 degrees F.
When you have stiff peaks, stop the machine and remove the bowl. Immediately sprinkle the dry ingredients and lemon zest over the egg whites and fold in with a rubber spatula, working carefully to avoid deflating the whites. Fold in half of the blueberries. 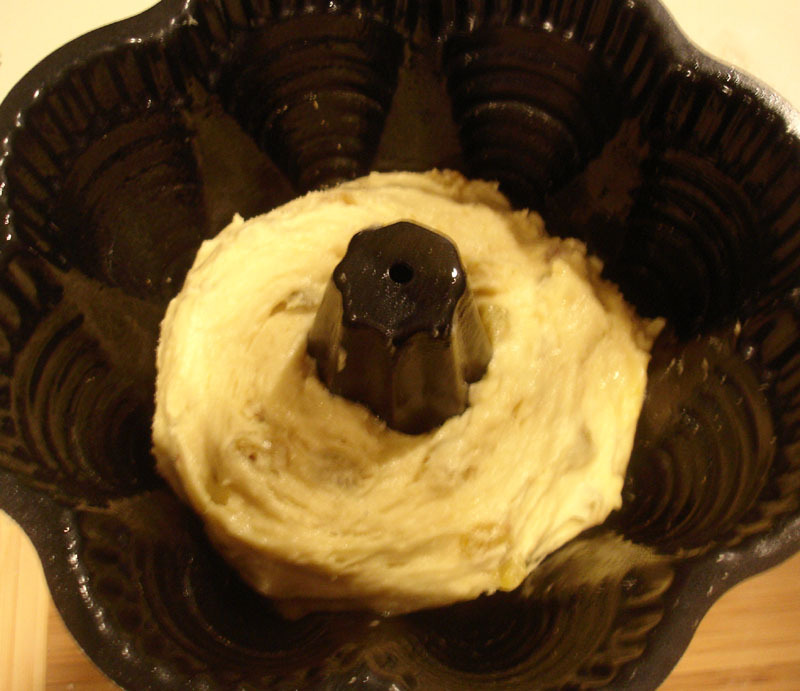 Divide the batter among the muffin cups so that each is two-thirds full. 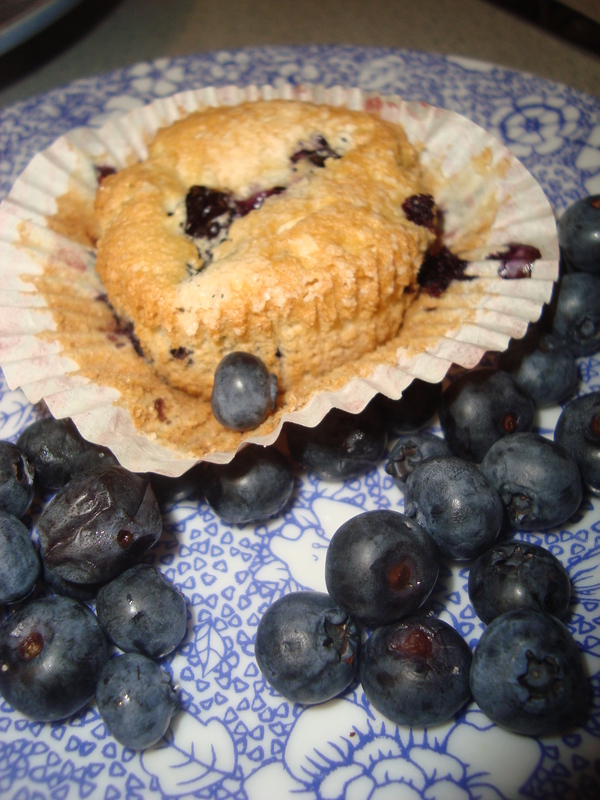 Top each muffin with a few more blueberries and sprinkle with 1/2 teaspoon granulated sugar. 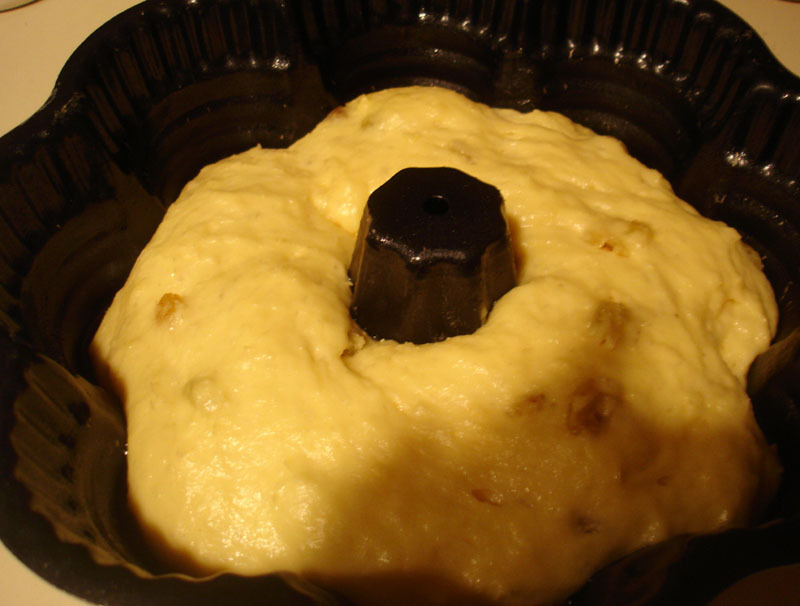 Bake on the center rack until the muffins are lightly golden and a cake tester insterted in their centers comes out clean, 20-25 minutes. Remove the muffins from the tin as soon as they come out of the oven and transfer them to a wire rack to cool for 15 minutes. Serve within 4 hours. I recently attended a lady’s brunch with 4 other fabulous females at Scarlet Oak Tavern in the Queen Anne’s corner of Hingham. Scarlet Oak Tavern is located in a 250 year old colonial house and has a cozy New England vibe with a Pottery Barn-esque decor. I’d had brunch at Scarlet Oak Tavern a couple of times before with my husband and decided that it would be a great place for brunch with the girls. They have a full bar, so if someone wanted to order a bloody mary or a mimosa to go with brunch, they’d be able to. We had a reservation via OpenTable.com, which made it super-convenient. Our table was ready when we arrived and we were seated immediately. I ordered the Prime Rib Hash ($13) which comes in a small cast iron skillet with a side dish of fruit salad. The hash has large chunks of beef and potatoes with a tomato-based sauce. I like this hash but it wasn’t quite what Lisa expected due to the tomato and she didn’t enjoy it as much. Amy ordered the stuffed brioche French toast with candied cranberries and sweet marscapone ($8.5). This is my husband’s favorite brunch option at scarlet oak. It is sweet and satisfying with lightly tart bits of cranberries nestled in the creamy sweetened marscapone cheese. Kathy order the brunch pizza ($12), which is an individual=sized pizza topped with asparagus, ham, eggs, and hollandaise sauce. Scarlet Oak has a large bar area with a cozy lounge with a fireplace in one corner. The bar area has a special tavern menu with lots of appetizers and casual fare. I will definitely be planning a girls night out after-work event there soon. In the warmer months they also have an outdoor seating area. Scarlet Oak has plenty of on-site parking. Is there anything quite so refreshing as some juicy citrus first thing in the morning?? I found a recipe for a citrus salad on epicurious.com. It was a little heavy on the grapefruit, so I reduced the amount of grapefruit and added some clementines and blood oranges. The assembled salad was bright & happy and was quickly gobbled up by the citrus-loving Mr.Mango. Place mint and sugar in processor. Using on/off turns, blend until mint is finely chopped, occasionally scraping down sides of bowl. Sprinkle mint sugar and pomegranate seeds over fruit; serve. One of our favorite breakfast guilty pleasures is Flour Bakery in the South End. On Sunday mornings, the bakery is abuzz with folks lined up to pick out their breakfast treats from those displayed in the various platters and baskets arranged on the countertop. We ordered several items to go and took them home to enjoy as we began decorating for the holidays. The berry bread pudding is moist and topped with blueberries and raspberries. My husband is incapable of going to Flour Bakery and NOT getting this bread pudding. For me, one of the true treats of Flour Bakery are the cream-filled donuts. These donuts are only available on Sundays and are filled with smooth, soft sweet cream. These are not the overly sweet vanilla frosting filled donuts from Dunking Donuts. Flour’s donuts are puffy and light (for a donut) and coated with fine sugar. The sticky buns at Flour Bakery are well-known for beating Bobby Flay’s sticky buns on the Food Network’s Throwdown. These sticky buns are pretty close to sticky bun nirvana. The sticky glaze has just the right amount of caramel-y sweetness and the top has a smattering of pecans. They also have a good egg sandwich that I usually order without the bacon. It is served on a fresh crusty roll with Dijon mustard and lettuce. Sooo good! I haven’t tried lunch at Flour Bakery but I’ve heard good things about their sandwiches and will hopefully get to lunch there soon. Be warned: the lines can often go out the door on weekend mornings. The seating can be rather limited, but at least in the summer they offer a few additional tables outside on the sidewalk. If you have a day where you want to be trapped in your house all day poking at dough every half hour or so, have I got a recipe for you! 😉 Kugelhopf! This German/Alsatian breakfast cake is not something that you just whip together & throw in the oven. It takes lots of time and attention. And then, at long last it is time to put that puppy in the oven. The resultant baked could is more bread-like in texture than cake like. Mine was dotted with plump golden raisins and topped with a dusting of confectioners sugar. It was great spread with a bit of orange marmalade and served with a cup of tea for breakfast. I enjoyed make the Kugelhopf as its been awhile since I baked anything that involved using yeast and I loved how it involved using techniques than some of the recent Dorie picks. 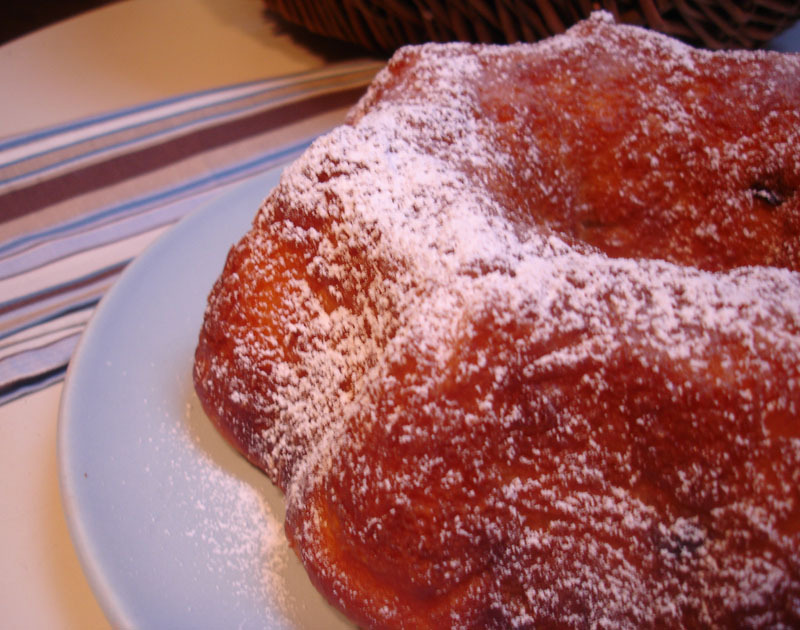 Kugelhopf was selected for this week’s Tuesdays with Dorie recipe by landa at The All-Purpose Girl. 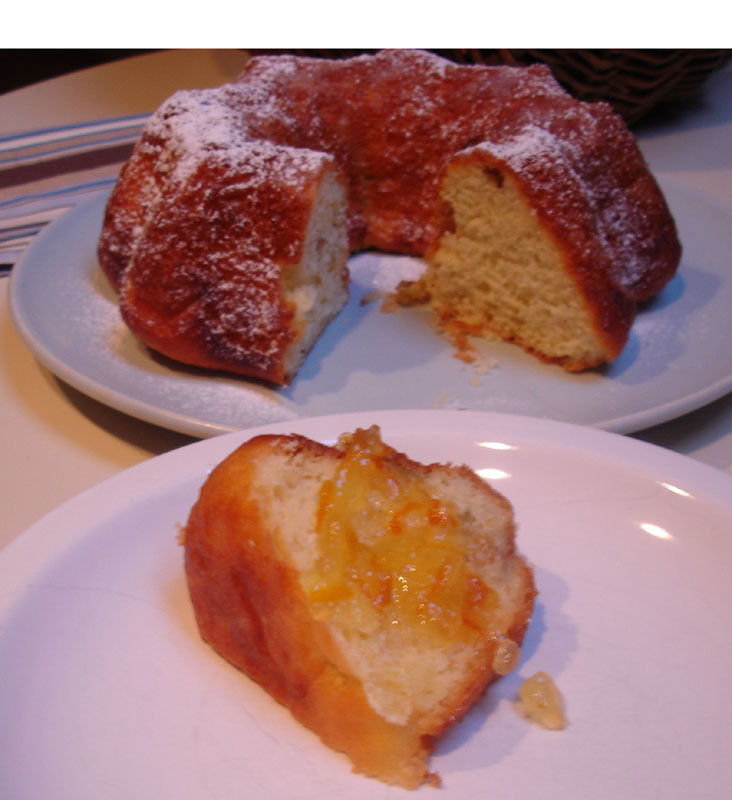 Please stop by her blog for the Kugelhopf recipe and to read about her quality time with Kugelhopf.